To contact directly the Domaine de la Valette , please use the below form, An email with a link to this page will be sent to the provided email address. 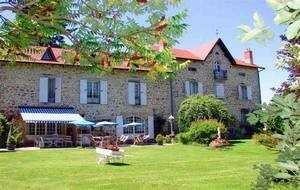 Placed in the village of Jullianges this impressive house of maître of the XIXth century, set of a wooded and flowered park of a hectare welcomes today the tourists of passage. The house provides a fully equipped kitchen and laundry room. in the heavens of beds well-kept and in pleasant bathrooms are at your disposal. Among these are also 3 magnificent suites.